This photo intrigues me. It was kindly provided by the French National Stud system (les Haras nationaux) but the farrier (le marechal ferrant) is not identified. If you double-click or otherwise enlarge the image to full screen view, you will see that this farrier is wearing his uniform; that's his coat and hat hanging on the wall behind the horse. This is odd, because the farriers I met in France at the national studs wore dark work clothes under their aprons, although the instructor at Haras du Pin (the famous state stud of Percherons in Normandy) would grab his military hat and put it on whenever I took his photo. Perhaps this fellow had to wear his uniform to have his photo taken for the government. 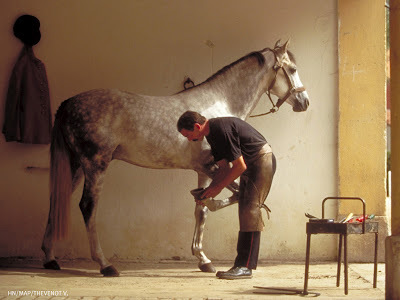 All the military farriers I saw in France worked in teams--a floorman on the horse, a fireman usually some distance away in the forge, and several go-between fellows who tried to get the hot shoe to the horse while it was still hot. The go-betweens were very fit from running back and forth all day, but they did seem to bear the brunt of impatience from both the fireman and the floorman. They couldn't scurry fast enough and because so many horses were being shod at once, they kept bumping into each other. The forge fires were in the shape of a huge wheel, with individual fires between the spokes. So the firemen were facing each other around a big round hearth. They were much too important to bump into anyone. And on the wall was a shrine to St. Eloi, the patron saint of farriers in France. Also in the middle of things was the rider, in uniform, whose job it was to hold up the horse's foot for the floorman. Maybe things are changing in France and the farriers work alone at the studs now. Notice that there is no footstand in the photo. There are some very spiffy new Euro designs (and hot colors) for hoofstands, but you don't see them in traditional shops or schools. I remember they were outlawed at the British farrier school when the late Tommy Williams was the instructor. I wonder if that has changed too! Except for the fact that this fellow's shirt seems to be a modern one, this photo could have been taken 100 years ago. Or 200 years ago. I wonder how long I'll be able to look at a photo and say that. New Treatment for Pain of Lam-"Mint"-Itis?